The Rescuer Syndrome is the biggest obstacle to supporting others in resolving their conflict. The belief that we know better than someone else how to resolve their conflict, or are somehow better equipped to do so, leads us to intervene or try to 'rescue' them in a way which disempowers them and inhibits their ability to resolve it themselves. Which they are actually quite capable of doing. In fact they are the only ones who can. ....which are used to support communication and conflict resolution, take into account the Rescuer Syndrome and provide ways of acknowledging it and reducing its impact. "I don’t know what’s best for me or you or the world. I don’t try to impose my will on you or anyone else. I don’t want to change you or improve you or convert you or help you or heal you. I just welcome things as they come and go. That’s true love. The best way of leading people is to let them find their own way. One day, a few years after I first found The Work inside me, my sons began to fight in our living room. I was sitting on the couch, very close to them. They were two grown men, in their twenties, and here they were on the floor, wrestling and pummelling each other and yelling “ Mom, Mom, make him stop!” All I saw were two men trying to connect, not knowing another way. I sat there just watching them, just loving them, and in that moment I didn’t have the slightest idea of intervening. There was no doing, no trickery to it. And suddenly they noticed, and they stopped fighting. I loved that they found their own solution. That was the last time they ever fought." To have intervened would have been to suppress and avoid the conflict and not allow resolution. If Katie had intervened, would she have had to take sides and decide who was in the right and in the wrong? Go to Your comments... to see what happened when KC from Wolverhampton, UK, tried Katie's approach when her own two young sons were fighting. Would this have led to resentment towards her and between her sons, thus adding to the stressful 'content' of the situation and to the number of people involved? Would the fighting have happened again anyway when she left the room? Many people will recognise this outcome from their squabbles with their siblings when they were younger. For many the issues arising from those conflicts are still unresolved and the subsequent rescuing actions of the parent still leave a bitter taste. To trust that others have the capacity to resolve their own conflicts is an enormous challenge, particularly when those involved are people we feel close to. So what are the 'symptoms' of Rescuer Syndrome? 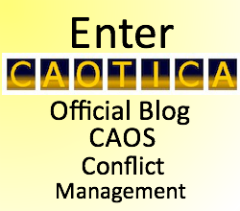 Alan Sharland, author of the Communication and Conflict website is Director of CAOS Conflict Management, where he has a blog called CAOTICA, please visit by clicking this banner and if you like what you see please subscribe to CAOTICA. "But if two people are beating the crap out of each other/ are going to war/ are being nasty to each other/ are giving each other the cold shoulder ....... Something has to be done!" And what is it we feel should be done? - We may intervene and 'tell them off' or punish them in some way. - We may try to persuade them that they 'shouldn't fight'. - We may take sides to support the person we feel is in the weakest or most 'morally correct' position in the situation. - We may try to 'even the score' in the situation. But how do you work out what the 'score' is in the first place? And what if someone else doesn't agree that the scores are even and tries to 'even the score up again' for the other person? On it will go, continuously adding more and more people to the fray, escalating the conflict rather than resolving it. Some people may say: 'Well what about places like Darfur and Kosovo, you can't just sit there and allow those things to happen'. Well if there was enough hatred and resentment and anger present in those places for such atrocities to occur, I think the point is that the conflict will have been suppressed and avoided for so long that the atrocities were an almost inevitable outcome. But banishing Rescuer Syndrome from our approach to conflict resolution does not mean we just do nothing and let conflicts become destructive and more and more violent. We need to use a more effective way of responding which does not have the destructive and escalating features of the Rescuer Syndrome. So what is that approach? No-one is an expert in what happens in such situations as Darfur, or any destructive conflict situation come to that. If there were 'experts' on such situations, surely the situations wouldn't still be happening? We would have found 'the answer', told everyone about it from our expert position, understanding and knowledge and we would all live in a war free world. I heard someone say on the radio the other day that the situation in Darfur was due to the shortage of water. It wasn't due to any such external factor. How do I know? No destructive response to conflict ever is. The atrocities were due to the fact that those involved had never learned to respond to their conflict in any other way. To blame the lack of water is another conflict avoidance 'technique', where the situation is 'analysed' and social, political, geo-political, etc. reasons are given for a situation occurring, instead of looking at the way in which the situation was responded to in order to find a better way. 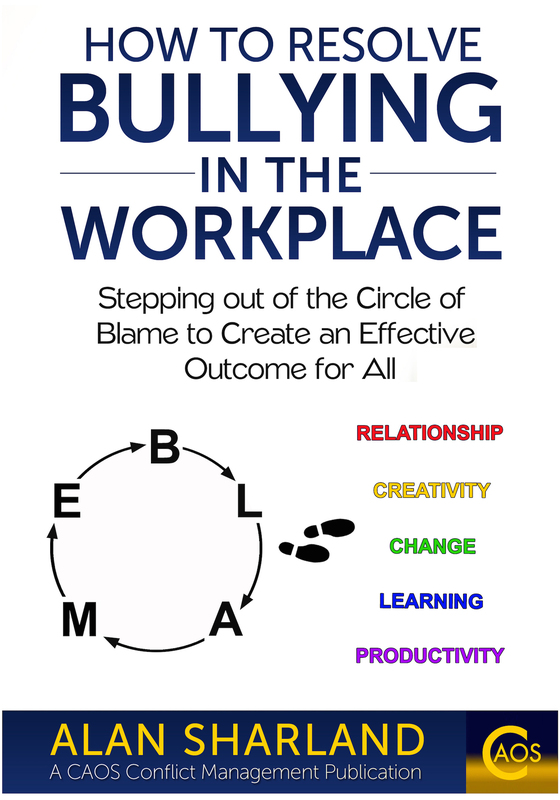 Any destructive conflict arises from the fact that we have a tiny repertoire of skills and practices and sensitivities for responding to conflict when it has become destructive and its impact has started to escalate. Our traditional responses tend to make it worse rather than resolve it. The conflict itself may have been over water, but the atrocities were the response to the conflict. All the time we say the problem is the lack of water, the real issue is ignored. To hold such a view means we see ourselves as powerless to resolve the conflict, as if the destructive responses are inevitable. 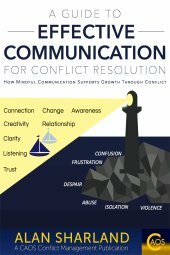 The real issue is our lack of understanding about what constitutes effective communication and effective conflict resolution. To return to the basis of Katie's story above, and it is reflected in many of the situations described on this website, most disputes escalate simply because of the intervention of others who try to rescue either the situation or one of the sides in the conflict. However well meaning the person or people doing the intervention. When the rescuing is advocacy for one side, and particularly where it is not even requested by one or all of those involved, the intervention can only escalate the situation. How can it not? Suddenly the number of people involved in the situation has increased and the 'sticks' being used to 'even the score' are getting bigger and bigger. Many people claim to be impartial when they are not, sometimes simply by virtue of their role causing a conflict of interests. But often they do not act impartially either, despite claiming to do so. The skills used to promote conflict resolution (Listening, Summarising and Questioning)and the ways in which they are used, meet the challenges involved in maintaining impartiality. 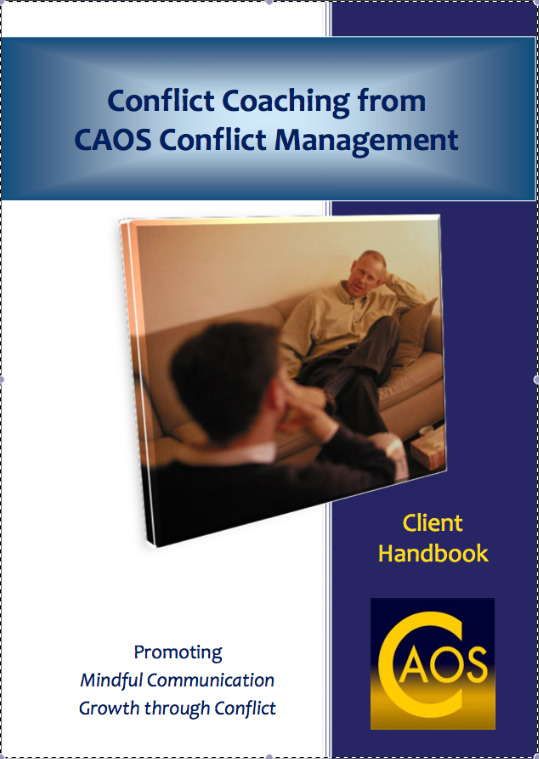 Click here for an e-book describing how these skills are used in the field of mediation, conflict coaching and conflict management. When the intervention is trying to solve the problem for those involved, it immediately is coming from an assumption that they cannot solve it themselves. Otherwise, why do it? It will often be as much due to the interventionist's need for the conflict to be suppressed or avoided that they become involved as for any purely altruistic motives towards those experiencing the conflict. Whatever the reason or motivation, the rescuing intervention escalates the very thing it is trying to contain or suppress. Consider any of the major conflicts in the world as well as smaller close to home conflicts. Many major conflicts draw in others manifesting the Rescuer Syndrome in that some countries in the past have taken sides and provided support for one country in a conflict, often leading to the country they are in conflict with drawing support from other countries. Take Vietnam for example. Or if we look at the situation with Iraq, there was an explanation that its invasion was in all of our interests to save us from Weapons of Mass Destruction but also to save the 'oppressed people' of Iraq from their dictator. And yet death and destruction persists and will do so for some time to come. I put 'oppressed people' in inverted commas, as many people in Iraq consider themselves to be oppressed today, but just by a different oppressor. But before this is misinterpreted as a criticism and not simply an observation, let's look at ourselves in much closer to home settings, because we are all vulnerable to the Rescuer Syndrome and to criticise others who manifest it would be hypocritical. The important thing is to become conscious of its presence in a situation so that we can start to find other ways of responding. That is, to learn a more effective approach to conflict resolution. How often do people try to placate and smooth over disputes in their family because they don't like to see conflict occurring in it? Are they doing it for themselves or for those involved? Often it will be as much because they don't like to think their family does not 'get on' (conflict avoidance, the lid on the boiling pot) and so they will do it for their own needs and not the needs of those in dispute. That's understandable, we all want to meet our needs. But ultimately it escalates the very thing it seeks to suppress, and so, instead, no-one's needs are met. For example: An older relative cries when their offspring are fighting and so the offspring stop. Or others say "Don't fight, it upsets your Grandma/ Grandpa/ Father/ Mother." The conflict is suppressed but not resolved and will emerge again later. Or does the relative come down in favour of one of the offspring and so the other one feels slighted or isolated, and may decide to leave home as a result, or stop visiting as they don't feel comfortable there any more? Again, the conflict is not resolved but suppressed and avoided. At work, two employees are arguing. The boss either decides to play 'Mum' or 'Dad'(to rescue one of them) and comes down in favour of one and tells the other off.....and then finds himself subject to a Grievance Procedure taken out against him by the one 'told off'. So he is now involved in the dispute and it has escalated. As a result of trying to rescue one of them. Or he tries to solve the argument for them (rescue the situation) by suggesting ways of settling their differences. Of course they can't really argue with the boss and so they reluctantly accept his 'proposals'. He has not remained impartial in the situation and he has volunteered them and spoken for them in his attempt to rescue the situation. He has also disempowered them by taking the creation of the resolution of the situation out of their hands. He has also not shown an expectation of them to create a resolution. But his proposals clearly don't work and the build up of frustration between the employees explodes more forcefully second time around. This time however one of the boss's suggestions was not followed by one of them and so now the boss has to take the side of the other employee and says so, otherwise his reputation is on the line....... And then he finds himself subject to a Grievance Procedure taken out against him or having to give evidence at an Employment Tribunal after a claim is made by the other employee. And again, he is now involved in the dispute, and it has escalated. As a result of trying to rescue the situation. Rescuing contributes an enormous amount to what is often called Codependency in relationships. A desire to change others, for example if they have an addiction or even if they are only perceived to have a problem, can itself become addictive and so a 'co-dependency' arises. In this case a relationship is more like an inextricable knot, which those involved cannot undo, than a valuing and loving and accepting of each person within that relationship for who they are as an individual. Melody Beattie has written some inspiring and liberating books on this topic and some of these are shown in windows along the right side of this web page. ...But let there be spaces in your togetherness. Let it rather be a moving sea between the shores of your soles. So how do we respond in a way that does not mean we are rescuing, but still supports resolution of the conflict? All of the Principles of Effective Communication and the Underlying Philosophies of Mediation as well as the skills of Listening, Summarising and Questioning used to support communication and conflict resolution take into account the Rescuer Syndrome and provide ways of acknowledging it and reducing its impact. In August 2006, the Archbishop of York fasted for a week. He invited people ‘to join him in heart and mind to pray every hour for peace in the conflict between Israel and Lebanon, and for good community relations in Britain’. (Taken from The Diocese of York website). At the time there was a serious escalation of violence between Israel and Hezbollah based in Lebanon. Even as I write this in May 2007 the violence has escalated again. Some were saying words to the effect of: "What will that do?’ We've got to get out there and protest and shout and scream at the Politicians and define who is in the ‘wrong’ and condemn them. That’s what will make the difference!!" Unfortunately, people will disagree over who is in the ‘wrong’ and who is in the 'right'and perhaps there will be 2 protests, one supporting Israel and one supporting Hezbollah(we used to see something similar in Northern Ireland) and they will meet and violence will erupt and people will fight to get their chants heard more than the other protesters, and some of those in the 2 protests will scream abusive condemnations at each other. And there, we will have a mini-version of the war being protested about, re-created on the streets of our own locality. And all of this is rooted in the desire to ‘rescue’ those in conflict from that conflict. A feeling that we have to ‘stand up for them’. This is a noble intention but unfortunately, because it is caught up in the subjectivity of who is ‘right’ and who is ‘wrong’ in the situation, it turns out that both sides in the conflict have their rescuers who will stand up for them. And so the violence and destructive responses to conflict persist. A search for 'unity' when all it leads to is division. And the amount of violence in the world increases, not decreases. Some will read my words and say that it is not ‘subjective’, it is the case that religious absolutes have been offended. Whether this is true or not, as ever, I am not talking about what has happened, I am talking about how it is responded to by those involved, and by those who become involved. A response that is a manifestation of the Rescuer Syndrome. London academics are leading efforts to revive a boycott of Israeli universities in protest at the country's treatment of Palestinians. A professor at the University of East London said today the issue should be debated at the annual congress of the Universities and Colleges Union next month. In this case the academics advocating this have clearly decided to 'even the score' for the Palestinians, possibly ignoring that some Palestinians have also acted in violent ways in the conflict. The academics have chosen to act in ways that 'rescue' one of the sides in the conflict. Correspondingly there is likely to be an aggressive reaction towards those advocating this by those who agree with the Israeli actions, or who feel unfairly 'tarred with the same brush' and so those people may become involved, by taking their own condemnatory actions. And so it goes on........ more and more people manifesting the Rescuer Syndrome in a clearly ineffective way of trying to respond to conflict. An approach which seeks to suppress it by use of greater force. An approach that often is described as 'unifying' when, on the contrary, it is divisive because it is unification against others. The Rescuer approach to conflict always escalates the severity and complexity of the conflict it tries to rescue. It magnifies the very thing it is trying to reduce. The approach defined by the Underlying Philosophies of Mediation and the approach described in the Principles of Effective Communication as well as the use of the skills - Listening, Summarising and Questioning - all come from the same approach as that used by the Archbishop of York. A continuous concern with not escalating the situation through advocacy for one side and not adding to the complexity of the situation by giving opinions or advice. It is always the case that people will be offended by things that other people do, all the time we hold on to particular views of the world and people say things that threaten our view. But whether we have to respond in the ways we do, and whether there is a need for rescuing behaviour by others is another matter. There are traditionally expected ways of responding. Aggression, revenge, taking sides. But in terms of resolving conflict - they don't work. They may suppress it and so it may feel like it worked. But it didn't, because it will always return and deep down those who suppressed it know that as they then have to go about 'on guard' against another 'uprising'. Look at any overbearing, dominating, even dictatorial figure, whether they be Saddam Hussein, an aggressive father, a cruel mother, a playground bully, an abusive boss, a terrorist. They all live in fear. Conflict is suppressed through their dominating actions. It is the only way they know. If we take any dispute between 2 people in any situation a common behaviour is that each will look for vindication of their view and their actions, and often they will find others who will provide this. The rescuing by those others will frequently include some active non-listening leading to the person they support becoming even more entrenched and feeling ‘justified’ in holding their views or taking the actions they have which have actually contributed to escalating the dispute. But sometimes this support goes further than just to do some active non–listening, and the others become actively involved in order to rescue the person they see as being treated badly, or being 'in the right'. And of course there is likely to be someone taking up a similar role as rescuer for the other person in dispute. And so, as a result of the perceived need to rescue those in dispute, the scale of the dispute increases to include more people. Instead, we can support resolution of the dispute without escalating it’s scale and it’s intensity by genuinely supporting the people in dispute to try to create different ways of responding that do not escalate the situation, and by staying impartial in how we respond to their relating of the details of the dispute. But, most importantly, by always bearing in mind that ownership of the situation remains with the original parties. Not by trying to rescue them. Many academic texts speak of people in dispute as if they all need rescuing, rarely referring to the intrinsic capacities of those in dispute to resolve things themselves, but often speak of them as passive recipients of outside ‘assistance’. Many will point to the strenuous efforts and successes of interventions in dispute situations, but I would claim that often, resolution occurs despite these interventons. Ultimately, they will only have worked if the people originally in dispute (and not those who have been drawn in to take sides and rescue) recognise and use their capacity to return to constructive responses. However much the ‘peacemakers’ may claim it was due to their interventions and however much it contributes to their later book describing their technique for solving people’s conflicts for them. Imagine how things would be if the people who live in other parts of the world, who involve themselves, through voicing opinions and making stands and taking positions on such situations as the conflict in Israel/ Lebanon, with a view to supporting one ‘side’ of the situation, were, instead, to act like the Archbishop of York. There are people in the UK and other parts of the world who have never been to Israel and yet act in a way that is not impartial and has clear features of the Rescuer Syndrome, advocating for or against Israel, or Hezbollah. These people will never experience the outcomes of the conflict or of any agreements that are created between the protagonists but are contributing to the escalation of the dispute and adding to the violence in the world by taking sides in the situation instead of acting in ways similar to the Archbishop. May 2008: We see exactly the same thing happening about Tibet at the moment. People all over the world acting in violent ways protesting about the situation there. Gross negative generalisations about 'the Chinese' being made via the media and in the day to day language of those who debate the situation. Violence protesting at violence. This despite the iconic person who symbolises the situation in Tibet being the Dalai Lama. Everybody who rescues is angry at having to do it. When they realise that they no longer have to heal the world as they were encouraged to do in childhood, at a time when they were least capable of doing it, and that in fact they are far more effective if they let other people take care of themselves, they are much happier.